You can’t start a fire, you can’t start a fire without a spark. You lust and do not have. When I moved back to Portland in the summer 1977, I was excited that I would be attending Whitaker Middle School for 8th grade with half a dozen Community School alums, including my best friend Dave Linn. When school started I also was reunited with my best friend from my first two years of school, Mike Pitts. And a friend from third grade, Ricky Munson, was in my home room. The grades were divided into two teams who had most of their classes together, and unfortunately Dave and I were on different teams, so we rarely if ever were in the same class. But I also found that Dave was moving in a social circle I would probably never be included in, the ‘popular’ kids. It seemed like we were on passing ships every day. At Whitaker I continued to feel like an outsider. But now that I was with some people that I had grown up with, Northeast Portlanders, my tribe, not seeming to fit in was a different sort of a ordeal than my alienation in Estacada had been. Our school was a hive of fads. Though I loved Star Wars, there were other trends and fashions I could not or did not want to follow. Saturday Night Fever had brought the disco craze to new heights. In our school, for some strange reason, ski jackets were in fashion, even though it hardly ever snowed in Portland or got below 40 degrees. There was a lot of polyester and feathered hairdos and curly perms, even on boys. Dave and his friends had taken to dedicating songs to one another. I don’t mean calling a radio station as in days of old and requesting a song and and having the DJ dedicate it to someone. If a song came on the radio, and you thought it was especially illustrative of a classmate, you would say, “I dedicate this song to you.” Someone would dedicate to the new kid in class the Eagles’ New Kid in Town. A girl who was a good dancer was bound to have a friend dedicate to her Abba’s Dancing Queen. The only time I approached the cutting edge was when I got a newly popular brand of tennis shoes. When I showed up in gym class wearing a pair of red waffle-soled shoes with a yellow Nike swoosh, even the jocks took notice (“Pre wore Nikes.”) But it wasn’t enough to get a scrawny, bookish nerd like me into their circle. And having friends in the circle also did not get you in. In the spring, when we took our big outdoor school trip to Lake Malheur in southeastern Oregon, I spent most of the second day on the bus sitting with and getting to know Carolyn Wetter, in my eyes just about the prettiest girl in 8th grade and firmly established in the circle. We had a great time together, and the whole day I kept wondering why she was willing to even be seen talking with me — even taking a walk together at our lunch stop. But when outdoor school was over, the ref sent us back to our corners, and we never got back in the ring, so to speak. At school, she’d smile at me when no one was looking and I’d nod, but I wasn’t in the circle, and I wasn’t going to be. Problem was, my friend Dave was in the circle. We couldn’t hang out at school and I lived miles from the school and everyone else who went there. So when Dave invited me to join Sea Scouts with him, I jumped at it, even though I had no personal attraction to the idea. Sea Scouts was an organization within Boy Scouts, something like a naval auxiliary. It was to the Navy what the Civil Air Patrol was to the Air Force. Each troupe was called a ship, and we dressed and conducted our meetings in Navy style. It really wasn’t me, but it was something new, I would learn how to sail, and I liked the leaders and other scouts. 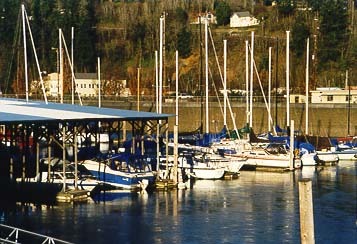 Each ship owned a sailboat and we had a 32-footer our ship had built that we moored on the Columbia River. 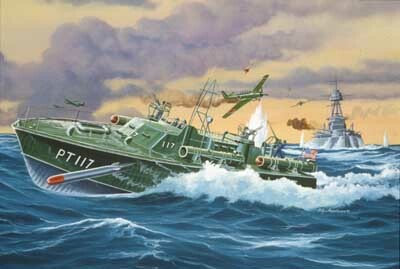 There were girls’ ships as well, and all the ships in the Portland area collectively owned a WW2 PT boat, like the boat commanded by JFK in 1943 when it was split in two by a Japanese destroyer in the Solomon Islands. Our boat had been disarmed and the gas engines replaced with one diesel engine: they didn't want to hand over that kind of speed to teenagers. The highlight of the year was an annual trip up the Columbia on the 80-foot disarmed motor torpedo boat. The crew was coed. We met with a girls’ ship to plan the trip with our leaders, and at that meeting I met Marti.I don’t recall how that meeting went, but we must have shown an obvious interest in each other, because at the end of the evening, Ben, one of the older scouts, took me side. We looked up to the older guys. Ben, probably 17, took his job as a role model seriously. “I saw you met Marti. Cute, huh? “Well, I just want you to understand something about her.” He had a sincere, big-brotherly bearing that fixed my attention. “I mean, Marti — I’ve seen her, we’ve all seen her… go from guy to guy. She’s a –” He stopped himself from using that word, or the other word. Yeah, okay. But I was 14. The part of my brain that knows good advice when it hears it did not yet function in any useful way. On our trip we sailed 30 or 40 miles from our moorage in Portland down the Columbia to the small river port of Kalama, on the Washington side. We each had a turn at the helm. We had to work with a fellow scout who was navigating, find the beacons on shore and use them to steer the boat down the river. When it was my turn, I sailed the torpedo boat on a choppy, gray Columbia, under leaden skies, with wind and rain sweeping over me. I pulled my sailor’s cap down tight and brushed my forearm across my face, keeping an eye out for river traffic, debris and other hazards. It was just about the most exciting thing I had ever done in my 14 years. Until I saw Marti. That night, moored at Kalama, we were free to come and go until maybe 11:00. Below decks a radio was playing, and we were scattered throughout the boat, some playing cards or lying on their bunks. Somehow, I ended up alone with Marti, talking in the midship/galley section. The lights were off and only a little stray light kept us from complete darkness. I have no recollection of a single thing we talked about. Johnny Rivers’ Swayin’ to the Music (Slow Dancing) came on the radio and, as though scripted by a Hollywood cheese maker, she took my hand and stood up, and we were dancing. I had never danced like this, but that didn’t matter; she led. My heart was pounding as I realized I had no will of my own. The only will was Marti’s and I don’t think I could have said yes or no or man overboard. If I was going to give any more thought to Ben’s sober warning, it would have been now. But I didn’t. just the music on the radio. No one’s comin’, no one’s gonna telephone. Just me and you and the lights down low. We’re slow dancin’, swayin’ to the music. slow dancin’, just me and my girl. Slow dancin’, swayin’ to the music. I am not making this up, as Dave Barry likes to say. This really happened. Then we stopped for a moment and kissed. Excluding games of spin-the-bottle, which allowed for little pecks on the cheek, this was my first kiss. The sad truth is I wasn’t that different from anyone, of any age, who can’t resist the feeling of being wanted. If this pretty girl wanted to dance with me, maybe I wasn’t worthless. If she wanted to kiss me, maybe I wasn’t a leper. In this little moment, in the dark, away from real life, it must not have mattered how I dressed, or what kind of haircut I had, or whether I followed all the fads. It seemed like someone wanted me. I couldn’t say no to that to save my life. 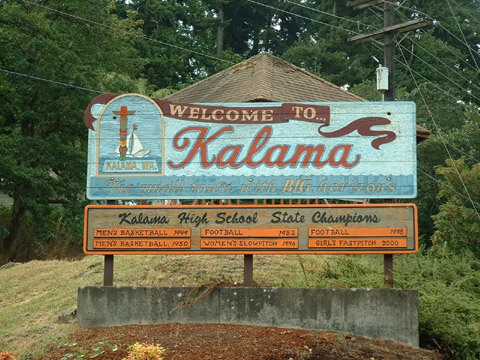 After a little more swayin’, we went ashore and walked through the dark, deserted streets of Kalama. We stopped under a street light in an empty gas station and kissed again. We slipped out of the light and stood against the shadowed wall of an old brick building. We stood in the dark and barren town, embracing and kissing and meaning two absolutely opposite things to one another. Everything and nothing. Dave and I sat in his room a few days later, darkened like we had been by the clouds on our river journey: two 14 year old boys, carried by the elements of nature, driven from within by our own nature, and whipped and blown every minute. Life just seemed to be making less sense all the time. I thought I would see her, maybe ask her out. I thought we’d gotten off to a pretty good start. Who could say these crazy feelings weren’t the first stirrings of love — the feathery kind of love they sing about on the AM. You know — you meet, you kiss, you get to know each other, you can’t live without each other — like that? Maybe my chronology was a little off, but she did give me her number. Why would she do that if she didn’t want to talk to me again? Dave’s mood mirrored my own, as if it had happened to him as well. So much love in this heart of mine. You’re the one I thought I’d never find. Dave lifted his head and looked at me earnestly. This entry was posted in Autoblography and tagged 70s fads, first kiss, Kalama WA, PT boat, Sea Scouts, slow dancing, Whitaker Middle School by Steve Dehner. Bookmark the permalink.